﻿ As Ebola Lingers in Liberia, What Have We Learned? As Liberia, which accounted for the most fatalities last year, holds its breath once more, what have we learned from the deadliest Ebola outbreak in history? 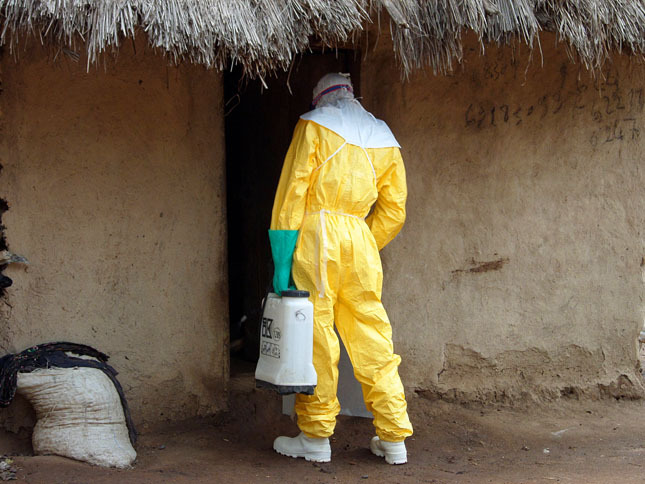 A total of 28,638 persons were infected during the 2014 epidemic, according to the WHO. Of this number, there were 11,315 deaths, though it is believed the actual number may be much higher due to underreported cases at the beginning. The international community has been criticized for slow response from the onset. A standby-and-watch attitude by the world’s powerful nations was only disrupted after the virus entered the United States and Europe. Eleven Ebola treatment units eventually built by the U.S government only saw 28 patients, according to The New York Times. What seems to have been most effective were interventions that strengthened existing community efforts. Locals began to take steps to fight the disease by voluntarily signing up to work at Ebola treatment units, establishing stations around the country for handwashing, and spreading awareness and guidance over the radio waves. Community leaders held town hall meetings and encouraged people not to touch a dead family member but call for help with their burial, shifting 180 degrees from traditional cultural practices to break the transmission of the disease. The disease started in a small village near the city of Guéckédou, Guinea, and made its way across the border into Liberia and the town of Foya three months later. Liberian health officials, ignorant about the nature of the new outbreak and facing a public that has little trust in them to begin with, found it difficult to communicate the severity of the disease. Some critics accused the government of not taking the outbreak seriously, at least not until a government official, Patrick Sawyer, who contracted the disease from his sister, fell sick on a flight to a conference of the Economic Community of West African States in Nigeria, Africa’s most populous country, and died in the airport. There was hysteria and fear among Liberian government officials whom Sawyer had interacted with that fateful July morning. He was the first person to knowingly transport the disease to another country. During her address to the nation on July 26, 2014, as Liberia commemorated its 167th Independence Day, President Ellen Johnson Sirleaf highlighted the many challenges facing Africa’s oldest republic. Liberia was experiencing a budget shortfall, depreciation in the exchange rate, and flooding. There was also a sharp decline in the price of the country’s main natural resource, rubber, further offsetting the balance of trade. And now Ebola. By this time the outbreak was spreading rapidly and more than 100 lives had been lost. At the John F. Kennedy Medical Center in July, Liberia’s main referral hospital, there were Ebola dead rotting away in a mortuary because they couldn’t be buried. One of the first persons who helped bury Ebola dead, identified as “Kartoon,” told me they sometimes had to take off their personal protective equipment and wear ordinary clothes to bury the dead because they were afraid people would chase them out of graveyards. Even when they could wear the suits, Kartoon and his three-man team did not have the full equipment. They would use plastic bags as face masks and gloves before a huge donation of personal protective equipment and health supplies arrived from China. For Kartoon and his team, fighting Ebola was a matter of obligation; they could not do otherwise. The health system was in peril, nurses and doctors already poorly paid were abandoning their posts because many of their colleagues were dying. Ebola had a death rate up to 90 percent. 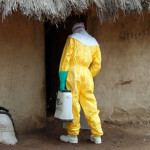 It was not until August 8 that the WHO declared the outbreak a public health emergency. This after two Americans, Nancy Writebol and Dr. Kent Brantly, who worked for the medical humanitarian organization Samaritan’s Purse, became infected. By this time there had been over 1,300 infections and 700 deaths. In Monrovia, patients were overwhelming the hospital beds of humanitarian organizations such as Medecins Sans Frontieres (MSF). Jina Moore, an American journalist who covered Ebola in Liberia for BuzzFeed, said in an interview that the initial response suffered from a failure of imagination. She said Ebola was conceived of as a national problem and so the thinking was that it should be taken care of by the governments in the affected countries. As people grew frustrated with the way the government handled the disease, there appeared pockets of discontent. There were demonstrations in every corner of the country. Dead bodies were dumped overnight in the streets. The government, seemingly overwhelmed by what was turning into a national security issue, reached out for help. President Ellen Johnson Sirleaf in her “letter to the world” broadcast on the BBC, called on the international community to join the fight against Ebola as the disease had no respects for borders. West Africa had lost more than 4,500 people with Liberia accounting for 2,200 of that number. By the time the United States had mobilized its response, deploying 3,000 troops, a 25-bed clinic for health workers, and 16 other Ebola treatment units in the region, the disease had slowed and there had been around 10,000 infections and close to 5,000 deaths. What has been praised as a game changer for slowing the transmission of the deadly virus is community engagement. Despite the confusion at the beginning of the outbreak when people were afraid and suspicious, local communities realized that banding together was the best way to conquer the disease. The way communities pulled together to not only take preventive measures, but identify the sick and report cases has been hailed by all. As the disease spread, communities pushed for safe burials and sought out sick persons in every home, sometimes helping to bring them to nearby health facilities, if there were any. Ashoka Mukpo, an American who contracted the virus while working for NBC as a freelancer in Liberia, said in an interview that community ownership over finding new cases was the single most important factor that led to the slowing of the transmission rate in Liberia. “Communities started to take more ownership and the government sort of changed their approach from this authoritarian, ‘We’re going to quarantine you; do what we tell you to do,’ to this more, ‘Let’s create a partnership’ kind of thing,” he said. Moore agreed, adding that the success of an epidemic response is not just about speed but character. It took quite a bit of time for international response to shift from “send rubber gloves” to “engage communities in a meaningful way,” Moore said. The kind of meaningful preventive community engagement that she witnessed was initiated by locals. Moore said it would have been helpful to see an international response that better augmented what Liberians were already leading in various communities. “I expect that would have made the response more relevant, more quickly, than some of the measures that were pursued instead,” she said. According to a report released by Harvard University and the London School of Hygiene and Tropical Medicine, by the end of January 2015 international partners had committed more than $5 billion for Ebola response. But the panel of 19 international experts also noted that the proportion of the funds actually spent on Ebola and in the affected countries remains unclear. More than 800 local health workers contracted the disease caring for the sick with more than 500 of them losing their lives. The World Bank Group estimates that the three most affected countries lost at least $1.6 billion in forgone economic growth in 2015. The challenge now is how West Africa bounces back from Ebola and tackles the rebuilding of its health infrastructure. There have been calls for the international community to fund the rebuilding of health services, but some experts believe that responsibility falls on local governments. The Harvard-London School of Hygiene and Tropical Medicine panel called for reform of the WHO, pointing to lack of accountability within the organization which many believe led to lapses in the Ebola response. They criticized the WHO for not pushing the governments in the affected countries to report the outbreak earlier in a transparent manner, and being unable to hold governments accountable for implementing trade and travel restrictions. “We need to know better and to think harder about how we are to prioritize what the best strategy would be to bring high-level political energy and commitment into enacting reforms especially of the World Health Organization,” said J. Stephen Morrison, senior vice president and director of CSIS’ Global Health Policy Center. Liberia is on a 42-day countdown to reach “Ebola free” status once again. The lessons from last year’s outbreak should not be buried with so many dead. Local government and the international community should take heed before the next global health challenge. Wade C. L. Williams is a freelance journalist from Liberia and a Hubert H. Humphrey/Fulbright fellow at the University of Maryland, College Park. She has covered Ebola in Liberia for the Associated Press. Sources: BBC, Center for Strategic and International Studies, Centers for Disease Control, The Daily Beast, Front Page Africa, Harvard Gazette, London School of Hygiene and Tropical Medicine, Medecins Sans Frontieres, NBC News, The New York Times, United Nations, World Bank, World Health Organization. Photo Credit: Courtesy of Jean-Louis Mosser/EC/ECHO. Video: Center for Strategic and International Studies.